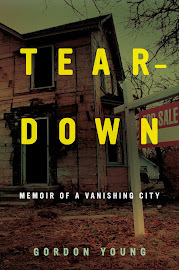 John Hantz is a wealthy money manager who lives in an older enclave of Detroit where all the houses are grand and not all of them are falling apart. Once a star stockbroker at American Express, he left 13 years ago to found his own firm. Today Hantz Financial Services has 20 offices in Michigan, Ohio, and Georgia, more than 500 employees, and $1.3 billion in assets under management. Hantz thinks farming could do his city a lot of good: restore big chunks of tax-delinquent, resource-draining urban blight to pastoral productivity; provide decent jobs with benefits; supply local markets and restaurants with fresh produce; attract tourists from all over the world; and -- most important of all -- stimulate development around the edges as the local land market tilts from stultifying abundance to something more like scarcity and investors move in. Hantz is willing to commit $30 million to the project. He'll start with a pilot program this spring involving up to 50 acres on Detroit's east side. 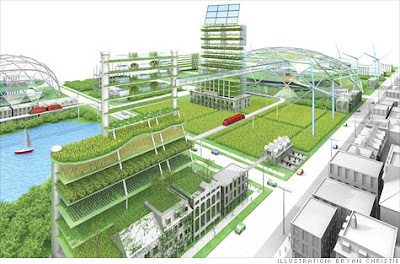 "Out of the gates," he says, "it'll be the largest urban farm in the world." I am hell-bent to revitalize Flint. Specifically the Civic Park District, which is an historical spot. Can we talk? Mr.Hantz? I think this idea is fantastic. The simple idea of supply and demand is what makes this idea work. We should give special consideration to homes that may have historical value. I do not see why entire swats have to be demoed. We should consider the idea of leaving some structures per block. If there is anything left that is. I know that some homes in flint could be saved. Or at least focused on a little more. Because of character and curb appeal. I guess a formula would have to be created for something like that. The point is to lower supply to meet up with the current demand. To eventually increase over all demand. Creating a revitalization process and new value in area's that are totally blown out all to hell! Hantz idea is an atrocity and not applicable to Flint. He wants to grow Christmas Trees in Detroit, not food. He can get federal subsidies for growing this commodity. Just think what he could do with a jobs training in farming and creating CSA's or small scale farms. He would not be empowering or building wealth in Detroits neighborhood but making money for a corportation. Flint doesn't have 'tracts' of land. Believe me I have driven up and down every neighborhood in this city looking for possibilities for urban farms. Maybe an acre, maybe two... if you can conglomerate the property. The last thing this community needs is another big company trying to 'save' it. How about a diverse economy of small and medium size businesses. We have the infrustructure. But not the support structure. Flint needs "saving" because we continue to import into our economic region at pretty much our normal rate, but our economic export rate has declined precipitously. Thus our regional wealth balance is in a nosedive. Flint can't be "saved" without businesses that are able to export outside our economic region. Certainly small- and medium-scale businesses can be regional exporters, but it's less likely; the most common forms for small businesses are retail (i.e. a regional importer) or service provider (usually neutral or importer, rarely exporter). Farming can be an exporter if what it grows is shippable and attractive to customers elsewhere...or it can substitute locally grown produce or other crops for imports. Farming can be an excellent contributor to a healthy regional economy. About the Christmas trees...the article claims that the likely first crops per their business plan are high-quality tomatoes and lettuce. Whatever they grow, though, if it's exportable or it replaces regional imports, it'll be good for Detroit's economy. Oh, and what's with the "corporations are evil" bit, eh? Do you think you can get many folks to go along with saving Flint via socialism? Everytime Detroit gets a bright idea about redevelopment it turns out being worse than it started with more people leaving the city and looking more like ancient ruins of a once great civilization. The best thing is to give away plots and have people come back to Detroit to build new homes or renovated old ones. This worked brillantly in Indianapolis in the 1980's and 90's. Owners had to promise to put so much money in the property and hold it for at least 10 years. Schools became full again, stores reappeared, and businesses came back to the downtown edge of the city. A back-to-the-future approach to ecnomics is needed for the Motor City. I know most people born in Detroit are given a UAW card with birth certificate at delivery, but the world has changed and Detroit hasn't. They let themselves be passed by. The potential for new neighborhoods and growth is greatest in Detroit than any city in America. Turning prime urban real estate into farm land is the dumbest idea they have had yet. It indicates they have given up on Detroit. Economic development with neighborhood development is the key to making Detroit the City it once was and will need to be to succeed and survive. Because the core population that still lives their is incapable of bringing the city back alone. Ya, Detroit is French in orgins meaning "Green Acres." Last time I checked, there's plenty of land available in Detroit for quite a few of the proposed farm-blocks, plus a couple of hundred thousand new or renovated houses. I reckon there's already a businessman interested in the farming angle. You go ahead and find that couple of hundred thousand families who will build new houses or renovate old ones, and live in them... no speculation or renting, they're bad for neighborhoods, OK?... and then all we'll have to do is figure out where to come up with jobs for all those new people, over and above the farming jobs, and Detroit will be all set. Flint and Detroit are just going to be smaller for several decades, if not forever. I'm not saying the two cities should just give up on trying to attract new jobs and industries, but they really need to accept that they will be smaller entities. There's no rule that says once a city reaches a certain size it has to stay that way, right? Just accept it and think about ways to shrink gracefully and humanely. I think that's what Kildee is trying to do. Of course, many can't stand him because he dared to face reality. JWiley...I started laughing before I got into your comment, because I knew where you were going. " Build it and they will come", concept shot down. Good work. Reminds me of, "It's about jobs stupid" statement. Well, it is. I think some of the comments point to a big problem, which is the way we see things. No one big thing is likely to "save Detroit". The thing is to work towards building back a system, and this can play a role. Even if all the acres planned come into being, I think it's a small dent in Detroit's land area and available lots. He actually sees pretty open to ideas and obviously wants to experiment a lot, creating something pretty sensitive to the city and not in line with "corporate farming" as we know it. I think the most critical thing is to make sure nobody gives the guy the farm in terms of subsidies or expropriate any land for him-- as has been done so many times before. He seems to want to put a lot of cash on the table. If it works we are talking about all kinds of potential spin offs in terms of tourism and horticultural research. The problem behind all of this is can Detroit's corrupt and bankrupt political culture sustain or allow a real business culture to develop. This might sound like a far reaching idea, but theirs a company in Upstate New York growing 100 percent organic food in a inside environment. They are using the most advance indoor growing technoligies to create disease and pollution free growth environments, which optimize plant growth and nutrition. The food is grown in a certified organic controlled environment, pollution and pest free. The resulting produce is of the highest quality, pure organic.